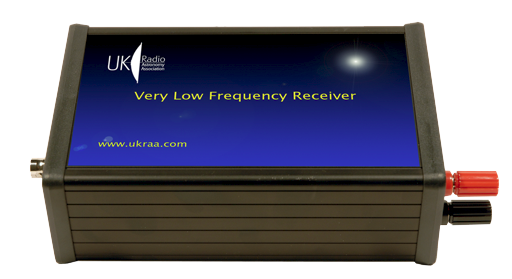 The UKRAA Very Low Frequency (VLF) Receiver is designed to record Sudden Ionospheric Disturbance (SIDs) induced by solar flares. It does this by monitoring transmissions from Earth-based beacons, which are affected by changes in the ionosphere, giving an indirect indication of events on the Sun. The main motivation for this work is to correlate the radio observations of solar activity with those from optical observers, and to follow the cycle of sunspots as they appear on the Sun. The VLF Receiver output is a voltage varying with time, which may be fed to any data logger or digital multimeter. Alternatively, it may be connected to a UKRAA Controller which is managed with the Starbase software (provided free of licensing charge by UKRAA), allowing observations to be stored centrally and shared with other observers. The VLF Receiver is also compatible with the popular Radio Sky-Pipe data logging software, but extra components will be required. The VLF Receiver has a tuning range of about 12 kHz to 35 kHz, requires a supply of 15 Volts DC at 35mA, and provides output signals at 0 – 2.5 Volts and 0 – 5 Volts. It is designed to work with the UKRAA VLF loop Aerial and the UKRAA VLF Aerial Tuning Unit. You may also find the UKRAA VLF Signal Generator useful during tuning of the system. The receiver comes pre-aligned and tested to 23.4kHz DHO38 Ramsloh Germany. The VLF Aerial Tuning Unit (ATU) including coax cable is designed to provide a means of tuning a VLF loop aerial over a wide range (50 pF to 3500 pF) of capacitance. The VLF Signal Generator provides a local signal source for tuning the VLF Receiver and the loop aerial to the frequency of military transmitter DHO38 which is located at Ramsloh in Germany. Fully assembled VLF aerial (Unvarnished). The UKRAA VLF Aerial is designed to receive VLF radio transmissions at suitable frequencies for the UKRAA VLF Receiver. This is a 15V regulated power supply with a 2.5mm centre positive jack plug, suitable for use with the VLF Receiver and other UKRAA products. This 1m RG58 cable with BNC Connectors connects the VLF Receiver to the Aerial Tuning Unit. NB it is included with the Aerial Tuning Unit but may be purchased separately. The Multi Frequency VLF Signal Generator provides a local signal source for tuning the VLF Receiver and the loop aerial to the frequency of any one of six frequencies.